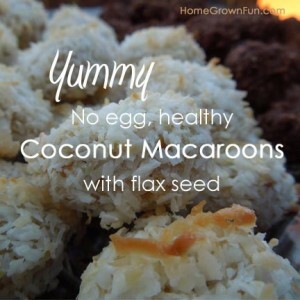 In my quest to make healthy lunchbox treats I created these flax seed-based coconut macaroons! They are barely sweet and my kids love them. This recipe makes about 108 small, 1-inch bites that fit into 3 canning jars (quart). 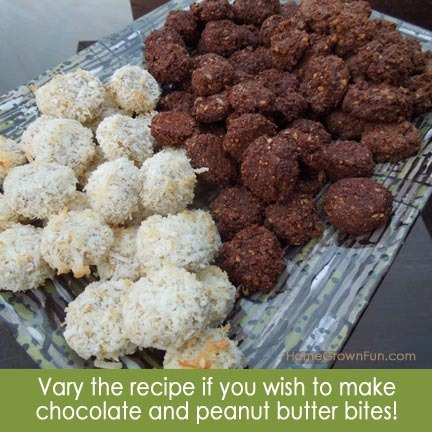 If you want different flavored macaroons, after creating approximately 36 bites, add chocolate to the mix. Then make another 36 and add peanut butter to the rest for the final batch. The possibilities are endless! As far as sugar content goes, I compared the amount used here with a regular macaroon cookie and the bites have less sugar by far, about 6.1 grams for 2, 1-inch bites versus 21 grams in a 2-inch macaroon cookie – helpful if you want to limit the intake of starches and sugars. Flax seed is also rich in B-Vitamins, Omega-3 Fatty Acids, fiber and antioxidants. 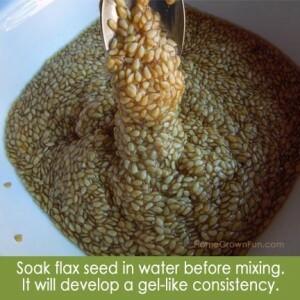 Soak all of the flax seed (2 1/2 cups) in 3 cups water for 5 hours, covered. It’s ok if it sits a bit longer. Preheat oven to 325°F. or 163°C. Line 3 baking pans with parchment paper. 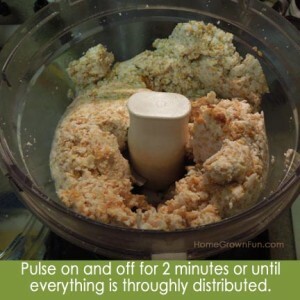 Mix all the ingredients in the main list in a food processor. Pulse for about 2 minutes or until all items are incorporated. The texture will be a grainy paste. 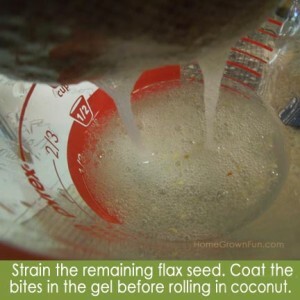 The gel fro the flax seed will bind everything together. Did you know you can substitute flax seed for eggs? Strain the remaining 1/2 cup soaked flax seed to retain the gel. 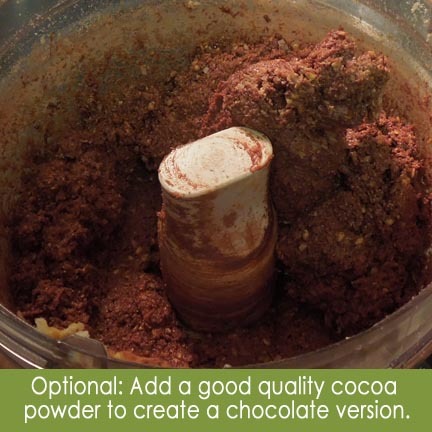 Scoop a small amount of the mix up and create a ball. Using your fingers, lightly coat the ball in the flax seed gel. 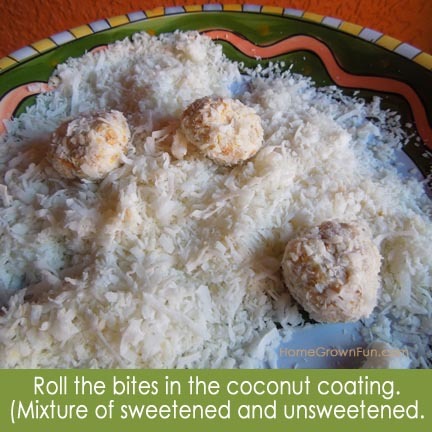 Roll in the coconut coating and place on the parchment paper. Press down on the ball slightly to make a barely flat bottom. Bake in the oven for 25 minutes or until the coconut looks toasted. Taste test to make sure they are baked to your liking. Let cool completely and store in a container. They will become moist in storage. I split the recipe up into thirds. After rolling the first batch of bites (around 36-40), I added 2/3 cup cocoa powder and another 1/2 cup sugar to the mix in the food processor. I then pulsed briefly to incorporate. I rolled another 36-42 and to the remaining mix I added 2/3 all natural peanut butter. I tasted the mix to see if I needed additional sugar and it was fine as-is. A word of caution: Flax seed foods should not be over-eaten since they are high in fiber and some people may have an unpleasant reaction to high levels of fiber. Lots of fiber could be a good thing too!